← This much I know about…my favourite Growth Mindset moment of the Rio Olympics! I have been a teacher for 28 years, a Headteacher for 13 years and, at the age of 52, this much I know about the Grammar School debate. Even Toby Young admits that Grammar Schools do nothing to help social mobility. The Government’s Social Mobility Tsar Alan Milburn says that more Grammar Schools would accentuate class divisions. Michael Gove’s Special Advisor, Sam Freedman, is set against introducing greater selection of students by ability, as is the editor of Schoolsweek, Laura McInerney. 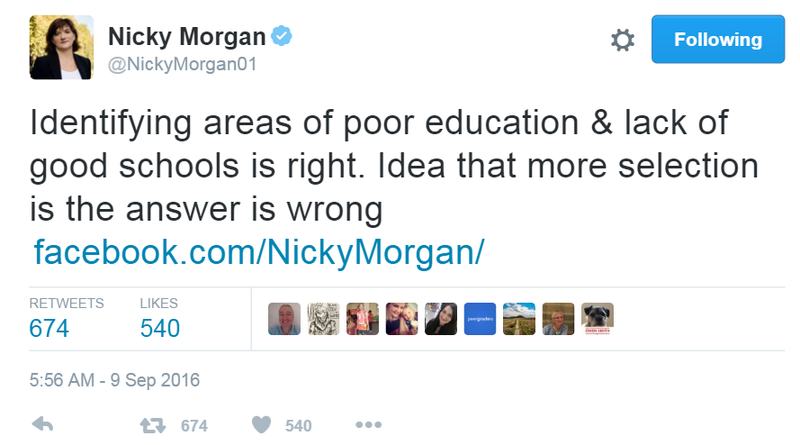 The erstwhile Secretary of State for Education, Nicky Morgan, voiced her disagreement with her own Prime Minister’s proposed new policy only hours after it announced. In his researchED 2016 speech today, entitled – according to the programme – “Upcoming Education Policy”, the Minister for School Standards, Nick Gibb, failed to mention selection of Grammar Schools once; the subsequent Q&A session was dominated by the Grammar School issue and all his usual assuredness seeped from his face. 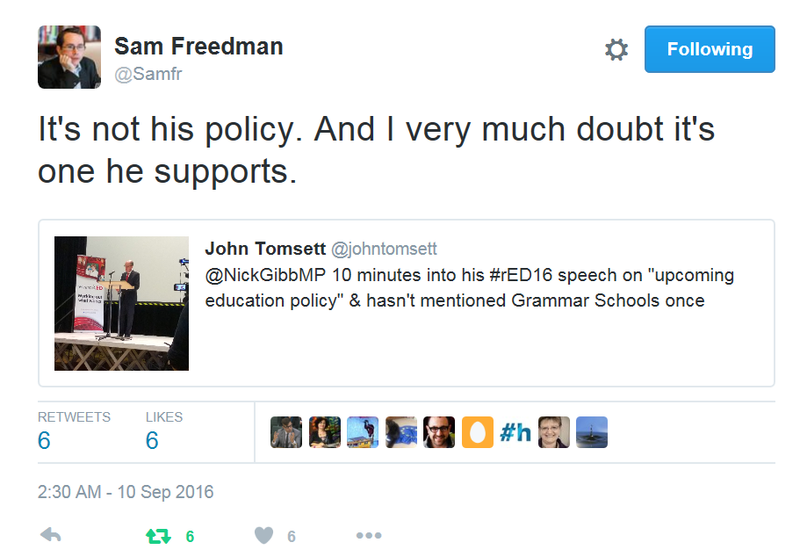 As Sam Freedman tweeted, it’s unlikely Nick Gibb agrees with the introduction of more Grammar Schools. With Young, Milburn, Freedman, Morgan and, probably, Gibb (as well as, allegedly, 100 Conservative MPs) arguing against May’s new Grammar School/Selection policy, there’s no need for me to repeat their arguments. Dr Becky Allen is worth reading on the Grammar School policy too, because, back in June, she wrote a blog post which gets to the heart of a key issue in this debate which has had little consideration thus far: teacher recruitment. One of her many illuminating, but, I suppose, obvious, findings is that students in Grammar Schools, “seem much more likely to be taught by someone who has an academic degree in the subject”, especially in mathematics and science. I know of a school whose Science department comprises 17 teachers, but only two have science degrees. The school is in one of the most deprived wards in the country. More than most, its students need the very best teachers. New Grammar Schools would compound the teacher recruitment challenge for schools whose students need the most effective teachers we can possibly find. I wrote in July that, “If May really does care about the ordinary working class family then sorting out the teacher recruitment crisis should be a priority”. Grammar Schools may well rob the vast majority of secondary schools of the top end of the ability range of students, but, as Becky Allen’s post suggests, they would surely do the very same to the top end of the ability range of teachers. What now for the EEE White Paper? A question I wanted to ask Nick Gibb, but failed to before he was whisked away. The brilliant Robert Hill has answered my question, however, in his blog on the ensuing education policy carnage, in which he says that “it feels like Theresa May’s chief of staff, Nick Timothy, is the de facto Secretary of State for Education”. Ah, yes, Nick Timothy… When I was preparing the slides for my researchED talk today I came across an old slide I had used last year. It was a quotation from Nick Timothy, taken from a New Schools Network blog post when he was the organisation’s director. He was arguing for a “parental trigger” which could lead to a head teacher’s dismissal; seems like the perfect way to entice would-be head teachers to apply for the top job. As we face not only a teacher recruitment problem, but a head teacher recruitment crisis, it’s good to know who’s driving education policy in this country. Probably wise, now, to wait and read the Green Paper; it will be one of the most important education policy publications for a generation.